This article is about one of the airlines that have shared this name. For other uses of the name, see National Airlines (disambiguation). For 'national airlines', see Flag carrier. National Airlines was a United States airline that operated from 1934 to 1980. For most of its existence the company was headquartered at Miami International Airport, Florida. At its height, National Airlines had a network of "Coast-to-Coast-to-Coast" flights, linking Florida and the Gulf Coast with cities along the East Coast and large cities on the West Coast. From 1970 to 1978, National, Pan American World Airways (Pan Am) and Trans World Airlines (TWA) were the only U.S. airlines that operated scheduled passenger flights to Europe. The original logo of National Airlines, used from the 1930s to the early 1960s. National Airlines was founded by George T. Baker (1899-1963) in 1934. Its headquarters were in St. Petersburg, Florida and it was based at the city's Albert Whitted Airport. On October 15 of that year, revenue flights were launched, transporting passengers and mail from St. Petersburg to a few destinations within Florida using a fleet of two Ryan ST monoplanes. In 1935, the Stinson Trimotor was introduced with National Airlines, which were soon replaced by the Lockheed Model 10 Electra. In 1939, the company headquarters were moved to Jacksonville. By the end of the decade, the National Airlines network spanned from Miami to New Orleans, on what it called the Buccaneer Route. In 1940 the Lockheed Model 18 Lodestar became the backbone of National's fleet. National was awarded rights from Florida to New York City and other cities along the East Coast in 1944, with flights starting in 1945. In 1946 National got approval to fly to Havana, Cuba, which coincided with the introduction of the Douglas DC-4. The DC-4 allowed non-stop flights between Miami and New York that started on February 14, 1946. Later that year National relocated its headquarters to Miami International Airport; a maintenance base opened at Miami in 1950. The Douglas DC-6, National's first pressurized airliner, began flights on July 1, 1947 and reduced New York to Miami flight time from five to four hours. Flights on the DC-6 were marketed as Star Service. National ran the Piggy Bank Vacations campaign, promoting low-fare flights to Florida during the off-peak summer season. This decade saw the introduction of the Convair 340/440, the Douglas DC-7, and the Lockheed L-1049 Super Constellation. On December 10, 1958 National became the first airline to operate domestic jet flights, using a Boeing 707 leased from Pan American World Airways between Miami and New York. In 1959 the Lockheed L-188 Electra was introduced into the fleet. It was the only turboprop aircraft type ever operated by the airline. At the end of the decade Houston and Boston were the ends of the network with heavy emphasis on service between Florida and the U.S. East Coast and Gulf Coast. With the award of traffic rights on the southern transcontinental route on March 11, 1961, National Airlines gained access to California and began operating new Douglas DC-8 jetliners between Florida and Los Angeles and San Francisco with a number of flights making intermediate stops in Houston and/or New Orleans (previously, American Airlines, Delta Air Lines and National had together operated Douglas DC-6 and DC-7 propliner aircraft with interchange through-service between Miami and California). In March 1962, National was operating only one round trip transcontinental nonstop service: National flight numbers 34 and 35 between Miami and Los Angeles which were both flown with DC-8 jets. According to the front cover of its system timetable at the time, National billed itself as the "Airline of the Stars". Concerning international destinations in Central and South America, a cooperation involving interchange flights with Pan Am was set up. Also during the early 1960s, National inaugurated new service with the Lockheed Electra propjet to Las Vegas and San Diego. Eastbound coast to coast routes flown with the Electra at this time included San Diego-Los Angeles-Houston-New Orleans-Miami and San Francisco-Las Vegas-Houston-New Orleans-Tampa-Orlando-Jacksonville. 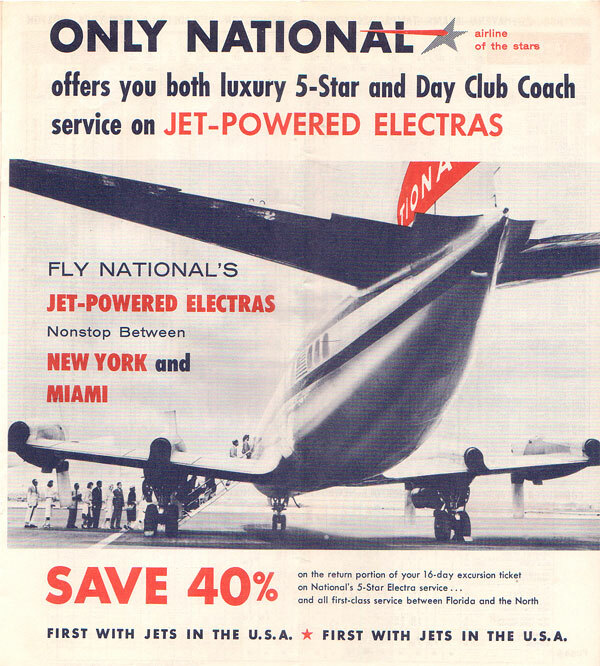 National was also operating other long, multistop routings with the Electra as this time such as Boston-New York City-Jacksonville-Orlando-Tampa-New Orleans-Houston-Las Vegas-San Francisco. National flight number 223 departed Boston at 7:30am and arrived in San Francisco at 8:42pm with this latter routing being flown on a daily basis. Total travel time for this flight was 16 hours and 12 minutes. In 1962 Louis Bergman "Bud" Maytag, Jr. (grandson of Maytag Corporation founder Frederick Louis Maytag I), who had previously led Frontier Airlines bought a majority share in National Airlines and replaced George T. Baker as CEO. In 1960, the airline modernized its fleet with new Douglas DC-8 jetliners which were then followed by ten new Boeing 727-100 trijets, the first of which was delivered in 1964. After the retirement of the Electras in 1968, National became an all-jet airline with the DC-8 and 727. The airline introduced the first jet service into Key West, FL in 1968 with the Boeing 727-100. The Douglas DC-8 fleet included the stretched Super DC-8-61 which was the largest aircraft type operated by the airline until the introduction of new wide body jetliners such as the Boeing 747 and McDonnell Douglas DC-10. In 1969, National was operating the Super DC-8 nonstop between Miami and New York JFK airport and also nonstop between Miami and Los Angeles with these flights having specific names such as "The Royal Biscayne", "The Royal Dolphin", "The Gotham" and "The Manhattan" between Miami and New York, and "The Californian" and "The Caribbean" between Miami and Los Angeles. On July 26, 1969 the Atlanta-San Francisco nonstop route was awarded to National and service began on October 1, 1969. It was National's only route out of Atlanta. A $17 million IBM electronic computer reservation system, called Res-A-Vision, was completed and put into operation in 1970. On June 16, 1970 National Airlines reintroduced international flights, when their Miami-London route opened (flights to Cuba were suspended in 1961 due to the Cuban Revolution). With the London route, they became the third U.S. transatlantic passenger carrier, after Pan Am and TWA. In October, the Boeing 747-100 jumbo jet, at that time the largest commercial airliner, entered service with National on the Miami-New York nonstop route on October 1, 1970 and the Miami-Los Angeles transcontinental nonstop route on October 25, 1970. National sold its 747s in May 1976. Also in 1970, National Airlines opened their own terminal at John F. Kennedy International Airport, which was dubbed the Sundrome. Having placed an order for ten aircraft back in 1969, the wide body McDonnell Douglas DC-10-10 was put in service on the Miami-New York route on December 15, 1971. A 1971 publicity campaign designed by F. William Free promoting National's flight attendants was criticized by the National Organization for Women as being sexist due to the slogan "I'm (flight attendant's name). Fly me. ", or similar. Seeing one of these posters in Manchester inspired Eric Stewart of 10cc to write the band's 1976 song "I'm Mandy Fly Me". In May 1973, the front cover of the airline's system timetable proudly proclaimed, "National has daily nonstop 747s from Miami to London". By early 1976, the airline was operating scheduled wide body DC-10 service to Houston (IAH), Las Vegas (LAS), Los Angeles (LAX), Miami (MIA), New Orleans (MSY), Orlando (MCO), San Diego (SAN), San Francisco (SFO), Tampa (TPA), West Palm Beach (PBI) and all three airports in the New York City area: John F. Kennedy (JFK), LaGuardia (LGA) and Newark (EWR). With the advent of the intercontinental McDonnell Douglas DC-10-30, National Airlines then expanded their European network by adding Paris (inaugurated on June 22, 1977), as well as Frankfurt, Amsterdam (both in 1978) and Zurich (in 1979). National began the very first nonstop flights from New Orleans to Europe (to Amsterdam) on July 2, 1978. National then began nonstop New York Kennedy (JFK)-Amsterdam flights on December 13, 1978, taking the route over from Pan Am. In 1975, National was forced to shut down for several months due to a strike by flight attendants. In the late 1970s, several airlines tried to take over National Airlines, who had become a major player in the southern transcontinental and Florida-East Coast airline markets. In 1978, Texas International Airlines (which was led by Frank Lorenzo at that time) acquired 24.6 percent of the shares, but did not succeed in the subsequent tender offer takeover bid. A similar attempt was made by Eastern Air Lines in 1979. At the same time, the shares held by Texas International were sold to Pan American World Airways, who emerged as a white knight and succeeded in accumulating a controlling majority. On January 7, 1980, the acquisition of National was completed, with Pan Am taking over the National Airlines fleet and route network. Pan Am continued to utilize the former National Miami maintenance base and headquarters building until Pan Am itself ceased operations in December 1991. Much later, National's "Sun King" logo was sold and "repackaged" much like Pan Am's to appear upon the branding of start up "low cost carrier" Southeast Airlines aircraft. 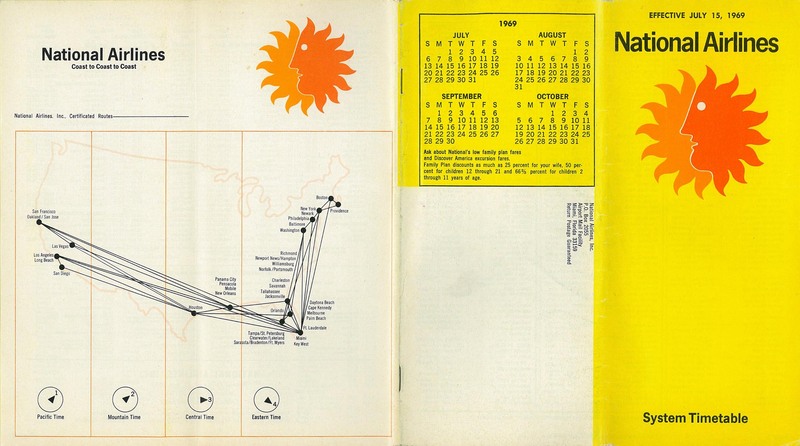 Most industry analysts believe that Pan Am paid too high a price for National, and was ill prepared to integrate National's domestic route network with Pan Am's own globe-girdling international network. The cultures of National and Pan Am also proved to be incompatible, making workforce integration difficult. Texas International walked away from their foiled attempt with a multi-million dollar stock profit and was poised for Lorenzo's next ventures—a startup airline in the high-density East coast corridor (New York Air), and subsequent acquisition of Continental Airlines. A Boeing 727 in the livery of National Airlines landing at Miami International Airport (1980). The airline had already been taken over by Pan Am. When National Airlines was acquired by Pan Am in 1980, the fleet consisted of 43 Boeing 727 aircraft (19 of the original series 100 model and 24 of the stretched series 200 variant), as well as 16 McDonnell Douglas DC-10 airliners (11 of the series 10 model used in domestic service and five of the intercontinental series 30 model used for service to Europe). On October 5, 1945 National Airlines Flight 16, a Lockheed Model 18 Lodestar (registered NC18199) crashed into a lake near Lakeland, Florida at 01:05 local time. The scheduled passenger flight had originated in Tampa, when the pilots encountered technical problems during approach of Lakeland Airport, which led to a failed go-around attempt. Of the 15 people on board, two passengers died. On January 14, 1951, 6 of the 28 passengers on board Flight 83 died when the aircraft, a Douglas DC-4 (registered N74685) overshot the runway and crashed into a ditch at Philadelphia International Airport. The pilots of the flight from New York City had tried to land the aircraft too far down the runway, instead of aborting the approach. Frankie Housley, the only stewardess, also lost her life. She has been regarded as a hero, as she had returned to the burning wreckage to lead passengers to safety. On February 11, 1952, Flight 101, a Douglas DC-6, crashed shortly after take-off from Newark Airport due to a failure of a propeller and subsequent loss of control. Of the 59 passengers on board, 26 died, as well as three of the four crew members. Four people on the ground were killed. With 46 fatalities (5 crew and 41 passengers, among them Billy DeBeck's widow), the disaster of Flight 470 on February 14, 1953 marks the worst accident in the history of National Airlines. The aircraft, a DC-6 registered N90893, crashed into the Gulf of Mexico 20 mi (32 km) off Mobile Point en route from Tampa to New Orleans, after having encountered severe turbulence. On November 16, 1959 at 00:55 local time, a Douglas DC-7 (registered N4891C) crashed into the Gulf of Mexico, the cause of which could not be determined. The 36 passengers and six crew aboard Flight 967 from Tampa to New Orleans died in the accident 35.6 mi (57.3 km) off the coast of Pilottown, Louisiana. On January 6, 1960, a bomb exploded aboard the DC-6 registered N8225H Flight 2511 en route from New York to Miami. In the subsequent crash near Bolivia, North Carolina, all 29 passengers and five crew died. On November 3, 1973, a McDonnell Douglas DC-10 (registered N60NA) suffered an uncontained engine failure over Datil, New Mexico while operating as Flight 27 from Houston to Las Vegas. Pieces of the turbine penetrated the fuselage, breaking a window in the passenger cabin and causing subsequent decompression. One passenger was sucked out of the aircraft and died. The flight made a successful emergency landing at Albuquerque. The wreckage of Flight 193 (1978). 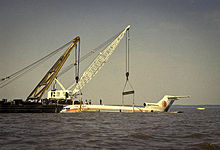 On May 8, 1978 at 21:20 local time, Flight 193 went down in Escambia Bay near Pensacola, in 12 ft (3.7 m) deep water. Of the 52 passengers aboard the Boeing 727 registered N4744, three lost their lives. The pilots had attempted to land the aircraft at Pensacola International Airport. On September 13, 1945, a National Airlines Lockheed Lodestar (registered NC33349) overshot the runway at Peter O. Knight Airport near Tampa in rainy weather and came to a rest in the water of Hillsborough Bay. There were eleven passengers and three crew members on board the scheduled flight from Miami. On October 11, 1945, another Lodestar (NC15555) was involved in a hull-loss accident. The pilots of Flight 23 from Jacksonville to Miami with 14 passengers aboard experienced an engine fire and attempted an emergency landing at Melbourne Airport. The approach was missed, but the pilots did not manage to pull the aircraft up, so it impacted the ground. On October 2, 1950, a cargo-configured Curtiss C-46 Commando (registered N1661M) was substantially damaged in a belly landing at Washington National Airport. On January 10, 1955 at 09:38, Flight 1 with ten passengers and three crew veered off the runway during a takeoff attempt at St. Petersburg-Clearwater Airport. The copilot had lost control of the Lockheed Lodestar (registered N33369) that had been bound for Sarasota. On November 15, 1961 at 17:10, National Airlines Flight 429 (a DC-6 registered N8228H) collided with Northeast Airlines Flight 120 (a Vickers Viscount) on the ground at Logan International Airport in Boston. The pilots of the National aircraft with 25 passengers aboard had commenced with the takeoff run without having been cleared to do so, hitting the landing Northeast plane. Between 1961 and 1980, 22 (attempted) hijackings on board National Airlines occurred, which involved the aircraft being demanded to be flown to Cuba. In 1969 alone, there were nine such occurrences. These events can be partly attributed to the tense Cuba–United States relations at that time, and the many flights of National Airlines in and to the southeastern United States, near Cuba. See List of Cuba – United States aircraft hijackings for more information. On March 8, 1971, a hijacker on board Flight 745, a Boeing 727 with 46 occupants en route from Mobile to New Orleans, demanded the aircraft be flown to Canada instead. On July 12, 1972, Michael Stanley Green and Ethiopian national Lulseged Tesfa hijacked National Airlines Flight 496 (a Boeing 727) while en route to New York from Philadelphia. On March 30, 1974, following a hostage taking in Sarasota, the perpetrator tried to hijack a parked National Airlines 727 at Sarasota-Brandenton Airport, but was prevented from doing so by a flight engineer. A similar hijacking attempt happened on January 3, 1975 at Pensacola Airport. ^ a b Klee, Ulrich; Bucher (1979). JP Airline-Fleets International (79 ed.). Switzerland: Editions JP. ISBN 3857581131. ^ "Walkout by 3,500 Cancels All Flights of National Airlines". The New York Times. February 1, 1970. p. 58. Retrieved September 24, 2009. Pickets marched at National's headquarters at Miami International Airport. ^ a b c d e f g h i j k l m n o p q r s t u v w x y National Airlines history, at Nationalsundowners.com, the Organization of Former Stewardesses and Flight Attendants with the Original National Airlines. ^ a b NAL: The 1930s, at Nationalsundowners.com, the Organization of Former Stewardesses and Flight Attendants with the Original National Airlines. ^ a b NAL: The 1940s, at Nationalsundowners.com, the Organization of Former Stewardesses and Flight Attendants with the Original National Airlines. ^ "Lewis Maytag Jr., Heir And National Airlines Chief". Retrieved August 22, 2014. ^ Lavietes, Stuart (January 8, 2003). "F. William Free, 74, Ad Man Behind 'Fly Me'". The New York Times. ^ February 1, 1976 Official Airline Guide (OAG), National Airlines flight schedules for EWR, IAH, JFK, LAS, LAX, LGA, MIA, MSY, MCO, PBI, SAN, SFO and TPA. ^ a b c Scott, Christian, J. (1998). Bring Songs to the Sky: Recollections of Continental Airlines, 1970–1986. Quadran Press. ^ a b c d e f g h i j Cite error: The named reference history overview was invoked but never defined (see the help page). ^ a b "World Airline Directory". Flight International. July 26, 1980. Retrieved November 8, 2011. ^ Roach, John; Eastwood, Tony (1992). Jet Airliner Production List. West Drayton, England: The Aviation Hobby Shop. ISBN 0-907178-43-X. ^ "Take Your Time". Time. January 22, 1951. Retrieved January 24, 2008. Wikimedia Commons has media related to National Airlines. Banning, Eugene (2001). Davies, R.E.G., ed. Airlines of Pan American since 1927. Paladwr Press. ISBN 1-888962-17-8. Conrad, Barnaby (1999). Pan Am: An Aviation Legend. Emeryville, CA: Woodford Press. ISBN 0-942627-55-5. Davies, R.E.G (1982) . Airlines of the United States Since 1914 (Revised ed.). Putnam. ISBN 0-370-30942-1. ——— (1987). Pan Am: An Airline and Its Aircraft. Illustrated by Mike Machat. Orion. ISBN 0-517-56639-7. Gandt, Robert L. (1995). Skygods: The Fall of Pan Am. New York: Morrow. ISBN 0-688-04615-0. Pan American Historical Foundation (2005). The Clipper Heritage: Pan American World Airways 1927-1991. Pan American Historical Foundation. Pan American World Airways Records. Otto G. Richter Library, University of Miami Archives. June 26, 1996.